The Ramada by Wyndham Beach Hotel Ajman Penthouse is located on the 13th floor with panoramic views across the Arabian Sea. The Penthouse spreads over 7,535 square feet and is comprised of a luxurious master bedroom along with a terrace to soak up the stunning views, two wide balconies, a barbecue area to enjoy open-air dining, a spacious living room with tranquil sea views plus Arabic style Majlis. It features four large bedrooms and the master’s bedroom includes a Jacuzzi bathroom. It also has a large, well-appointed dining room and well equipped kitchen. Guests staying in the Penthouse enjoy extensive VIP services. The Penthouse is accessible through one entry door thus providing ultimate convenience and privacy for the duration of your stay. Marvelling at the breathtaking views while enjoying the tasteful interior is an unforgettable experience for all those travellers appreciating elegance and warm ambiance. 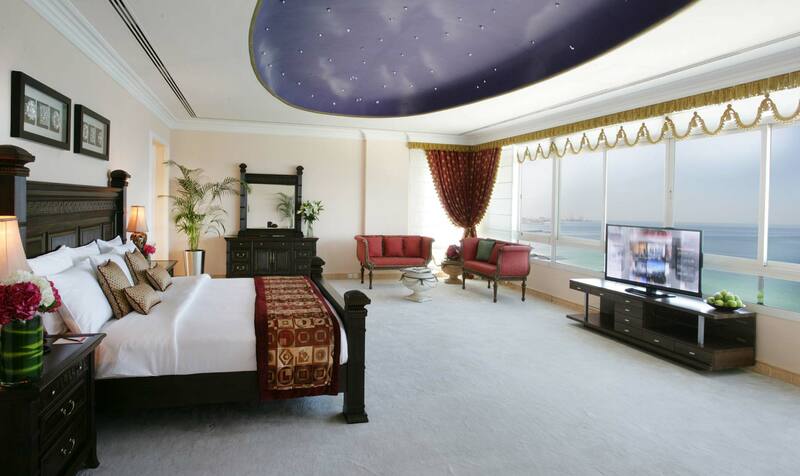 Whether you are staying for business or leisure, the hotel’s stylish Penthouse will offer you the best in accommodation and atmosphere in the Emirate of Ajman. To help guests relax, they can enjoy exclusive use of a private pool, billiard room and a fully-equipped kitchen to do some tasty home cooking. The Royal style marble top dining table seats 14 guests to dine in style at one time or enjoy in the BBQ area with breathtaking scenery across the Emirate. Penthouse also features a Maids Room and an elevator dedicated to the exclusive use of penthouse guests guaranteeing good privacy.